Lovat sealed a 2-0 away win in the top of the table match at Newtonmore to extend their 100% record and move four points clear at the Premiership summit. Kevin Bartlett was the hero for the Kiltarlity club with two goals. Lovat have won six out of six, while second-place 'More have four wins from five and are just a point clear of Kingussie, who beat Lochaber 5-2. Kyles had a 3-1 home success against Kinlochshiel and Glenurquhart beat bottom side Inveraray 4-1. In the game of the day at The Eilan, Newtonmore had the better of the first half but were unable to make the breakthrough. Lovat took the lead after 54 minutes as Bartlett's low shot beat goalkeeper Mike Ritchie. Champions 'More pushed hard for an equaliser but Bartlett scored his second with seven minutes left. Lovat manager Allan MacRae was delighted with the win but is not getting carried away. "It's massive for us but there's a long way to go," said MacRae. 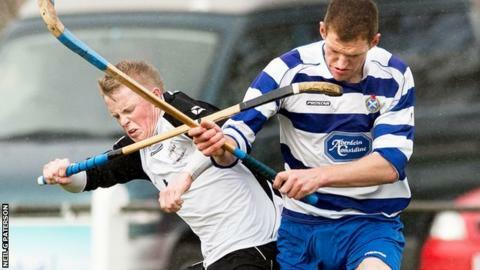 "Newtonmore have been the team in the past few years so it's nice. We rode our luck but got the ball in the net and that's what counted." Newtonmore manager Paul John MacKintosh was convinced his side merited the victory. "We dominated from start to finish. They had three shots on target and went away with two goals," he said. "Their keeper had umpteen saves in the first half and it was the same in the second. We hit the post twice and hit the bar. We murdered them and got beaten 2-0. On another day we would have won 6-2." At Spean Bridge, Savio Genini and Lee Bain gave Kingussie an early 2-0 lead over Lochaber but Ryan Johnstone and Ben Delaney squared it. Bain, who was later sent off along with Lochaber's Martin Johnstone, completed his double and Genini his hat trick. Roddy MacDonald scored two and Roberto Zavaroni hit one for Kyles at home to Kinlochshiel, who replied through Keith MacRae. For Glenurquhart, Fraser Heath netted a double with Lewis MacLennan and goalkeeper Stuart MacKintosh, who is the penalty taker, also on target. Euan McMurdo got Inveraray's goal at 2-0. In the Marine Harvest National Division, Craig Morrison scored four in Caberfeidh's 8-1 victory over Bute in Strathpeffer, while Jack MacDonald notched a double as Beauly won 5-0 at home to Glenorchy. In South Division Two, Calum MacLay scored nine on his 15th birthday as Glasgow Mid Argyll hammered Aberdour 15-0.